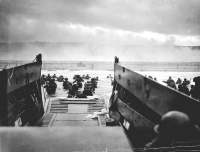 On June 6, 1944, the date during World War II when the Allies invaded western Europe. 1944 – World War II: the Battle of Normandy begins. D-Day, code named Operation Overlord, commences with the landing of 155,000 Allied troops on the beaches of Normandy in France. The allied soldiers quickly break through the Atlantic Wall and push inland in the largest amphibious military operation in history. Unless indicated otherwise, the text in this article is either based on Wikipedia article "June 6" or another language Wikipedia page thereof used under the terms of the GNU Free Documentation License; or on original research by Jahsonic and friends. See Art and Popular Culture's copyright notice. This page was last modified 06:21, 6 June 2014. This page has been accessed 6,756 times.